this is amazing folks. it has to be one of the discoveries of the century. a gorilla type ape, 2 metres tall and so ferocious it can kill lions has been discovered by scientistis in the congo. Scientists believe they have discovered a new group of giant apes in the jungles of central Africa. The animals, with characteristics of both gorillas and chimpanzees, have been sighted in the north of the Democratic Republic of Congo. According to local villagers, the apes are ferocious, and even capable of killing lions. The UK magazine New Scientist is to publish its report about the mysterious creatures next week. If they are a new species of primate, it could be one of the most important wildlife discoveries in decades. The discovery of these apes "reveals just how much we still have to learn about our closest living relatives," New Scientist says. 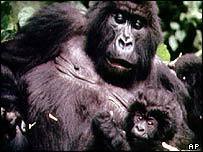 They stand up to two metres tall, the size of gorillas, and like gorillas, they nest on the ground, not in trees. But they live hundreds of kilometres away from any other known gorilla populations, and their diet is closer to that of chimpanzees. Primatologist Shelly Williams is thought to be the only scientist to have seen the apes. During her visit to DR Congo two years ago, she says she captured them on video and located their nests. She describes her encounter with them: "Four suddenly came rushing out of the bush towards me," she told New Scientist. "If this had been a bluff charge, they would have been screaming to intimidate us. These guys were quiet. And they were huge. They were coming in for the kill. I was directly in front of them, and as soon as they saw my face, they stopped and disappeared." The discovery has baffled scientists. * They could be hybrids, the product of gorillas mating with chimpanzees. So far, researchers have little to go on, but they now plan to return to northern DR Congo to study the apes further. In the meantime, there are fears that unless measures are taken to protect them, poaching could threaten this new group of primates before the mystery of their identity is resolved. "This is a lawless area," says Kenyan-based Swiss photographer Karl Ammann, who tipped Ms Williams off about the apes. "The government has practically no control over hunting. If we found something interesting it would attract more investment. People would be more interested in conserving it." can u post a photo of this amazing animal? If True woh sab firangiyon ki yeti aur bigfoot ki kahaniyon ko bhi credibility tatha sanshodhan ka boost milega. when i first read the article i, too, thought it was a joke or a hoax. but this news has just broken in the last few days. no doubt we will hear much more of this in the next few weeks and months.